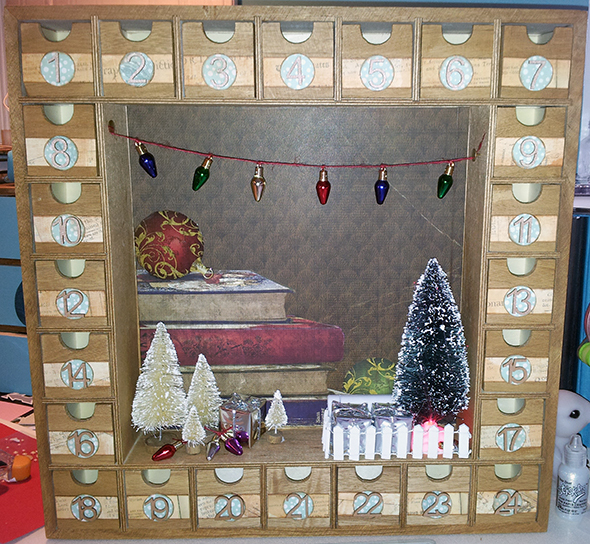 Hello and welcome to our last day of our 12 Days of Christmas celebrations! We have had so much fun over the last 12 days and hope you all have too. We hope you have gotten lots of Christmas inspiration and are getting in the Christmas spirit! 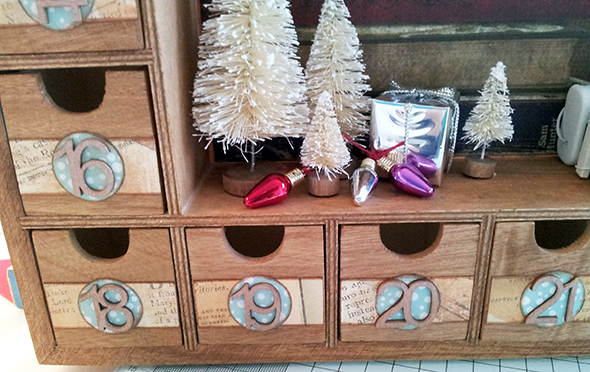 Today we have Nicole wrapping things off with a fun advent calendar tutorial. I used a light oak wood stain to stain my frame and the drawers. I gave it two coats to get a lovely deep colour. 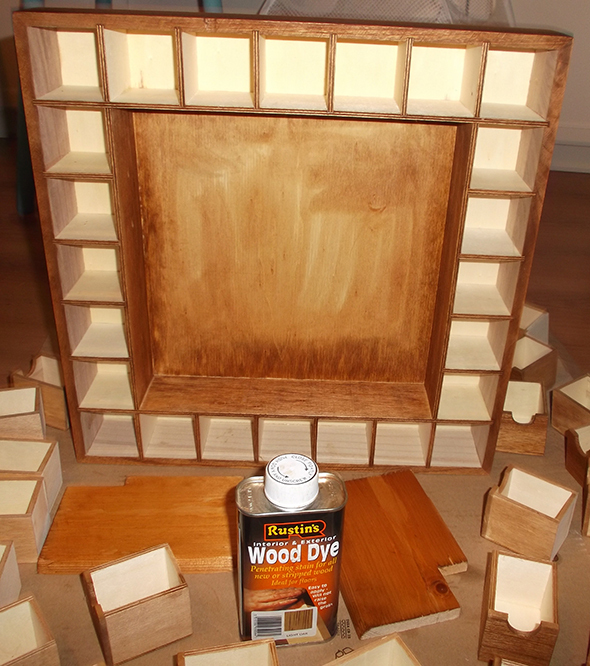 You could pain the frame or use Distress Stains if you like instead. Let this dry fully before moving on. 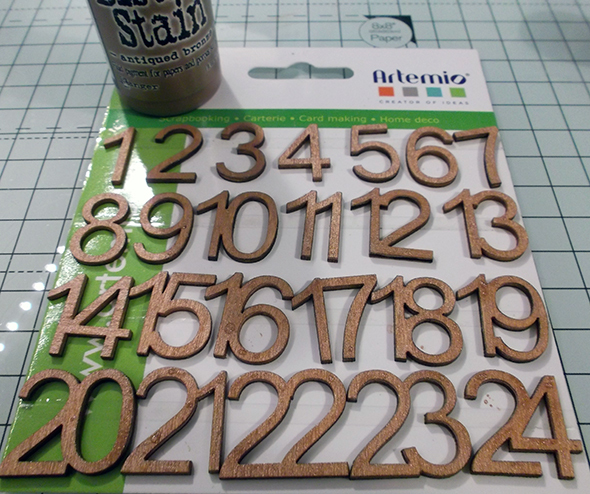 While the frame is drying paint or ink up your advent numbers. 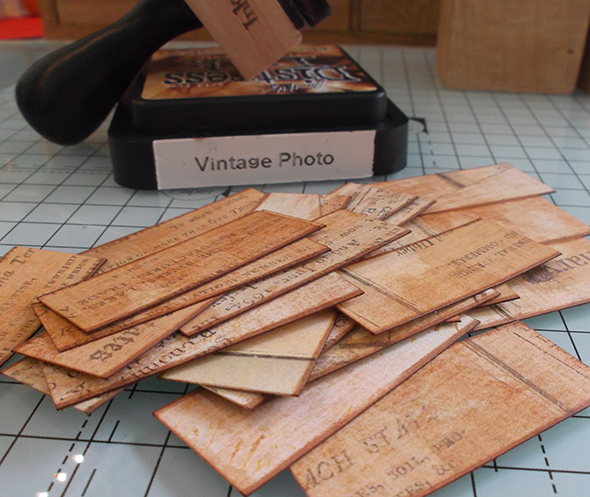 I used wooden ones but you could die cut them from paper/card/felt too. What ever you prefer! 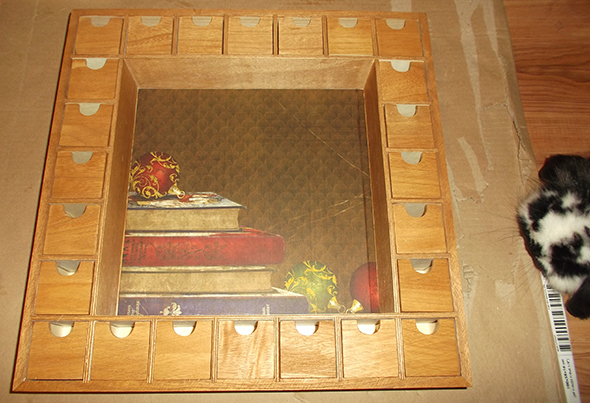 When your frame is fully dry choose a paper for the back of the inside frame. I used some BoBunny paper from a few years ago that I had been hoarding. 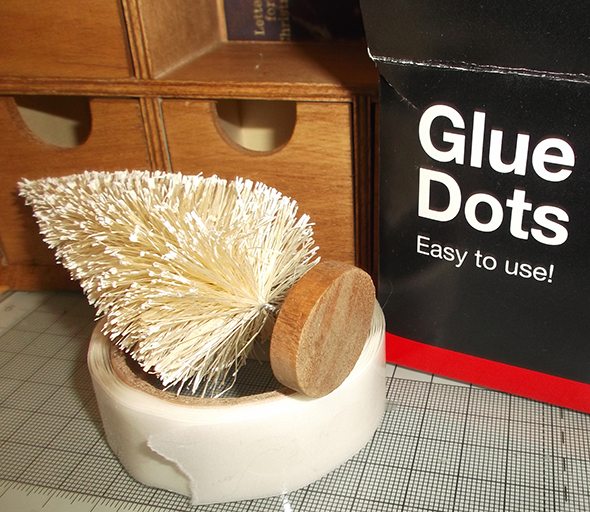 Cut it down to fit and adhere with a strong glue. 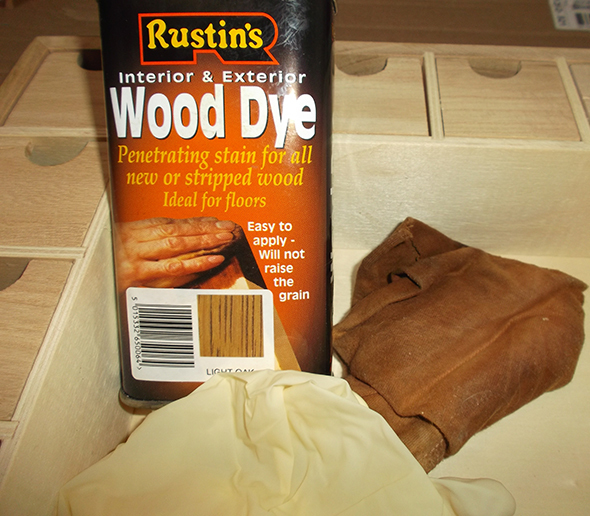 Apologies about the grubby sheet of cardboard – I use it to protect my floors when painting etc. And how cute a photo bomb is that? I swear rabbits are worse than cats for curiosity! You can now start building your scene inside. 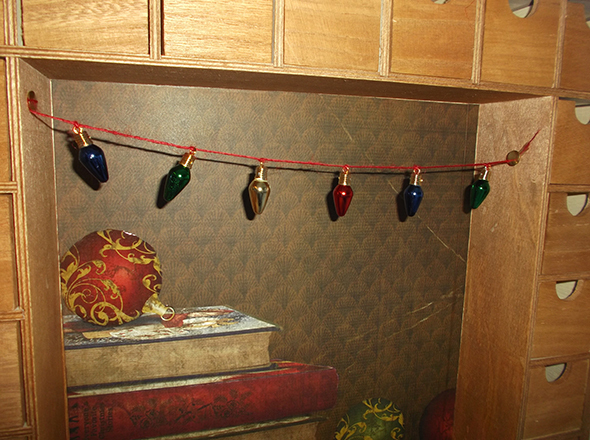 I used some mini light bulb charms and strung them on some red twine. 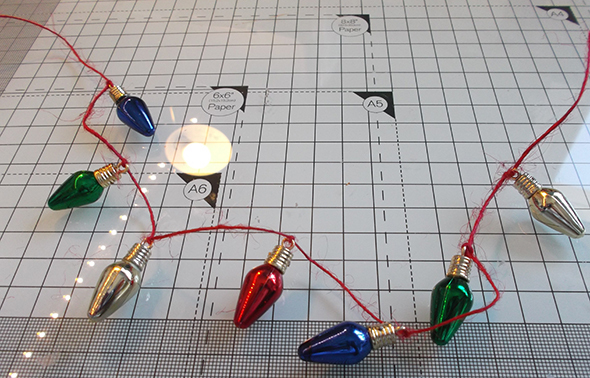 I used thumb tacks to stick this to my box to look like a string of festive lights. 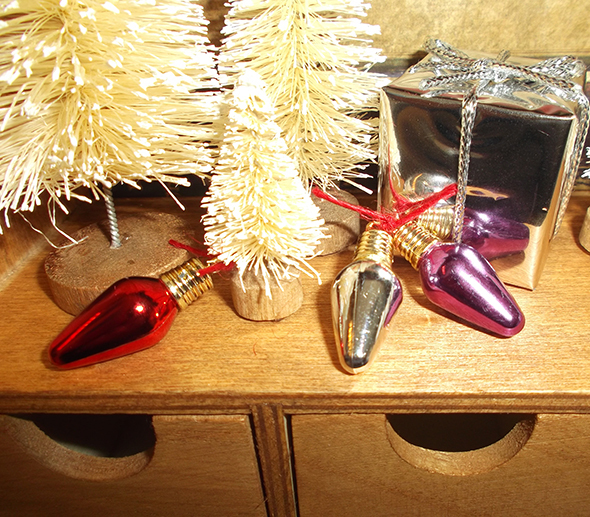 For the rest of my scene I used some mini bottle brush trees, mini presents and some more of the light bulbs. 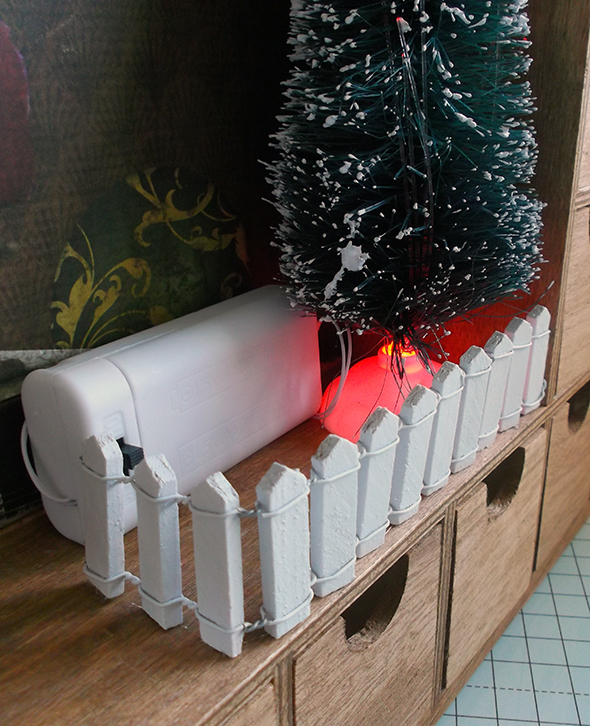 I used a light up tree from a Pound shop and hid the switch in behind the fence and presents. I used glue dots to adhere all the trees, presents and light bulbs. I used zip dry glue to glue the fence on. 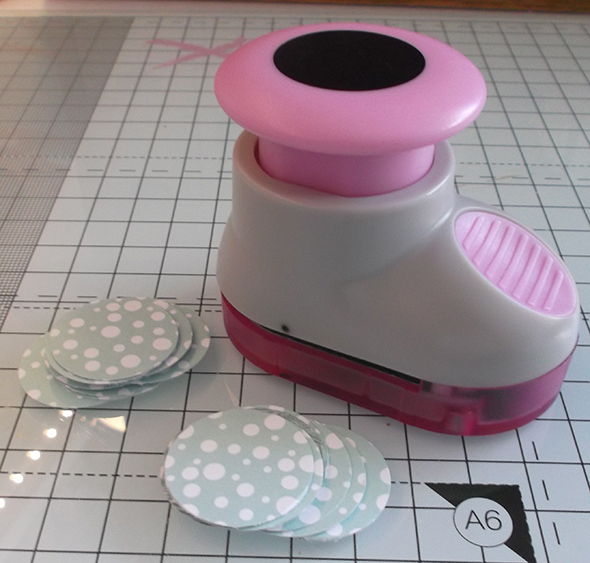 I used a 1″ circle punch to punch out 24 circles from patterned paper. 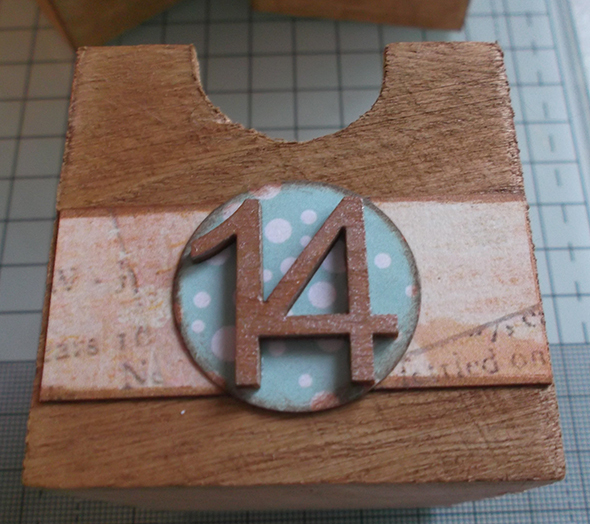 I also cut out 24 strips of paper at 4.7cm x 2cm to act as decorative strips for on the front of the drawers. I inked all of these and the circles with Vintage Photo Distress Ink. Embellish the front of the drawers. You can embellish as much as you like at this stage but I chose to keep it quite simple. Fill the drawers with little goodies and enjoy!! We hope you have enjoyed the 12 Days celebrations! 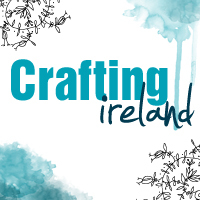 If you have been inspired by any of these projects show us your work over on our Facebook page!